This is a base class for threads. 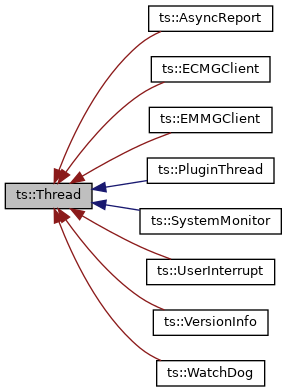 A thread object is typically implemented as a subclass of ts::Thread. The code to be executed in the thread shall be implemented in the method main(). This class implements operating system threads. Its implementation is operating system dependent. [in] attributes The set of attributes. Set new attributes to the thread. New attributes can be set as long as the thread is not started, i.e. as long as start() is not invoked. [in] attributes New attributes to set. True on success, false on error (if the thread is already started). Get a copy of the attributes of the thread. [out] attributes Attributes of the thread. The operating system thread is created and started. The code which is executed in the context of this thread is in the method main(). True on success, false on error (operating system error or the thread is already started). The thread which invokes this method is blocked until the execution of this thread object completes. Only one waiter thread is allowed. If several threads concurrently invoke waitForTermination() on the same Thread object, only the first one will wait. The method waitForTermination() returns an error to all other threads. This method is automatically invoked in the destructor. Thus, when a Thread object is declared in a control block and the thread has been started, the end of the control block hangs as long as the thread is not terminated. If the thread has not been started, however, the destructor does not wait (otherwise it would hang for ever). Do not use this method if the thread was created with the delete when terminated flag (ts::ThreadAttributes::setDeleteWhenTerminated). True on success, false on error. Errors include operating system errors, the thread is not yet started, the caller thread is this thread (waiting for ourself would result in a dead-lock). Check if the caller is running in the context of this thread. True if the caller of isCurrentThread() is running in the context of this thread. This hook is invoked in the context of the thread. Concrete thread classes shall implement this pure virtual method. This method is invoked in the context of the created thread when it is started. Yield execution of the current thread. Execution is passed to another thread, if any is waiting for execution. This should not change the behaviour of correctly-written applications.